Coal mining operations can generate significant amounts of airborne respirable coal dust, the inhalation of which can lead to pneumoconiosis, a disabling and potentially fatal lung disease. In metal, nonmetal, stone, sand and gravel mining operations and for select occupations in coal mines, the generation of respirable silica dust during mining is the primary concern. Inhalation of excessive levels of silica dust can lead to silicosis, another disabling and potentially fatal lung disease. 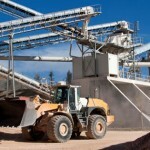 Air Purification Inc. will help you determine the best dust collection solution for your mining operations.